The only smart thing they did is give him money up front so they aren't doomed forever..
Their team is so QB dependent. As an NFL fan I am a little bit sad to see both the Colts and Packers despite back to back great QBs slowly becoming the Browns despite great QBs. If you can barely win with a QB and you're terrible without one, you probably need to have a more complete team! Both teams should trade their QBs and rebuild. At least the Packers unlike the Colts are using some of their cap room though so I guess I'll give them that. 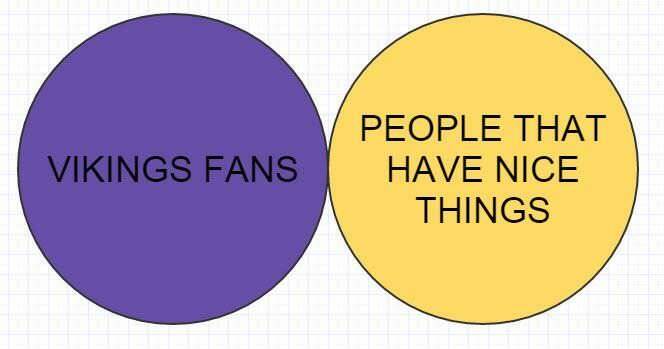 On a side note, I think the Vikings will have to consider trading Diggs in the offseason and possibly another player rather then letting him play out his final year and either getting nothing for him or overpaying him and not being able to have cap room for other things like keeping Barr, Kenricks, Hunter and a QB. mike2mike wrote: The only smart thing they did is give him money up front so they aren't doomed forever..
Adams has been very productive, even despite rotating QBs. Unlike Nelson, he seems to be ascending and their WR1. With Nelson seemingly not the guy he used to be, it was a move they needed to make. And yeah, Diggs has had problems staying healthy but with Thielen locked up (and probably underpaid based on his production), I'm hoping they can still resign him. As many problems as we've had finding good WRs and needing to surround whoever is our QB with weapons, I really don't want to be lacking for weapons. It'll be interesting how they prioritize. I saw a stat saying the Vikes are in the top-10 in cap space next year. They have some flexibility. Especially if they look to sign their own vs. free agency. Wait, are you saying the Packers need to trade Rodgers and the Colts Luck? That's an... interesting strategy that has rarely (if ever) happened. I'd love for the Packers to trade Rodgers. I think that is too much for Adams .. The big worry I would have with Adams is his concussions. halfgiz wrote: The big worry I would have with Adams is his concussions. You're gambling. But with Nelson declining and if Adams walks they're suddenly down to very few receiving threats. 1)Extending Barr, Hunter, Kendricks, Diggs all of which enter the final year of their contracts in 2018... that is a lot of money most likely... may be around $45M per year, just a ballpark random guess. 3)Signing any free agents or draft choices. Despite the cap room it will be a difficult offseason to both immediately get better, stay young or get younger and stay under the cap while filling all our needs and also providing a clear path forward to improve in the future. I think a two steps forward, one step backwards hasn't worked well so far but with all things considered we probably bump up into cap room and cap room is the limiter of how good this team can be. Trading a player or two and/or not paying big to keep a player or two even if it mean something neglecting a position or two for one year can go a long ways to freeing up future cap room, allowing a clear path forward, frontloading the guy's you sign to improve salary cap moving forward and developing and relying on youth. But I think comes at the expense of taking a step backwards. Adams is nothing special. I guess it just solidifies that position for a team with other needs, but with a Q like Rodgers, there are cheaper and/or younger options that could produce just the same as Adams. PacificNorseWest wrote: Adams is nothing special. I guess it just solidifies that position for a team with other needs, but with a Q like Rodgers, there are cheaper and/or younger options that could produce just the same as Adams. He has similar numbers to AT (with a lot more TDs). I wouldn't want AT walking, would you? He's no AJ Green or Antonio Brown but Adams has grown as receiver and is quite good. I understand that, but that’s not what I said. No, I would not want Thielen to go elsewhere, but if Aaron Rodgers were the QB for the Vikings, I would not pay Thielen a crap ton because Rodgers can make a lot of receivers look great. Adams has also been very inconsistent in his career. I don’t think he’s anything special. PacificNorseWest wrote: I understand that, but that’s not what I said. No, I would not want Thielen to go elsewhere, but if Aaron Rodgers were the QB for the Vikings, I would not pay Thielen a crap ton because Rodgers can make a lot of receivers look great. Inconsistent? I mean if you want to say he didn't catch 80 balls for 1,000 yards his rookie or sophomore years, sure. Some others might call that learning/growing. You're obviously entitled to your opinion but I think Adams deserved a nice contract. The dude caught 22 TDs and has nearly 2,000 receiving yards in the last two years. If he didn't get that from Green Bay he likely would've gotten it elsewhere. Is he the 5th best receiver in the NFL? No. But that's usually not how these things go down. I don’t really think this garners a big debate. I don’t think he’s irreplaceable and from a Vikings fans standpoint, I’m all for it because he’s not all that dangerous or a huge threat. Jordy was much better and it’s not like he’s Julio Jones — which with Rodgers would be scary as heck. You’re right that another team would pay and they’d probably overpay for him at that. Good for Adams for getting that contract, but again, he’s nothing special and as a Vikings fan, I’m all for this. Adams will earn more money next year than the entire Vikings WR corp.
Don’t really see why this is funny.